We've added a new trick you will find helpful if you will be migrating more than a couple legacy LonWorks devices to BACnet or Modbus networks. Some of our LonWorks gateways now have the ability to automatically install themselves. That means your field tech just needs to hook it up and turn it on, no fussing with configuration or network commissioning stuff in the field. We provide you with free tools and all the help you need to get the configuration figured out the first time. After that, preload it on the bench, and set it to search the network for a matching ID the next time it powers up. The self-installing trick has been added to our Babel Buster BB2-2010-NB, BB2-2011-NB and BB2-6020-NB LonWorks to Modbus gateways, and to our Babel Buster BB2-3020-NB and BB2-7020-NB LonWorks to BACnet gateways. We have Modbus RTU and Modbus TCP covered, as well as BACnet MS/TP and BACnet IP. The LonWorks side is Free Topology twisted pair. The non-bound gateways with the -NB suffix on the part number are designed to connect LonWorks devices to Modbus or BACnet networks. They poll network variables without binding, thus eliminating the need for network management tools. The only tool you need is the free tool we give you to tell the gateway which network variables you want to get data from or send data to. The non-bound LonWorks to Modbus gateway can be a Modbus RTU master or slave, or Modbus TCP client and server. The non-bound LonWorks to BACnet gateway simply behaves as a standard BACnet device on the BACnet MS/TP or BACnet IP network. Data flow is bidirectional between the LonWorks devices and the BACnet or Modbus networks. Multiple LonWorks devices are supported with a single gateway. The LonWorks network always interacts with Network Variables (NVs) in any LonWorks device, including the Babel Buster 2 LonWorks Gateways. 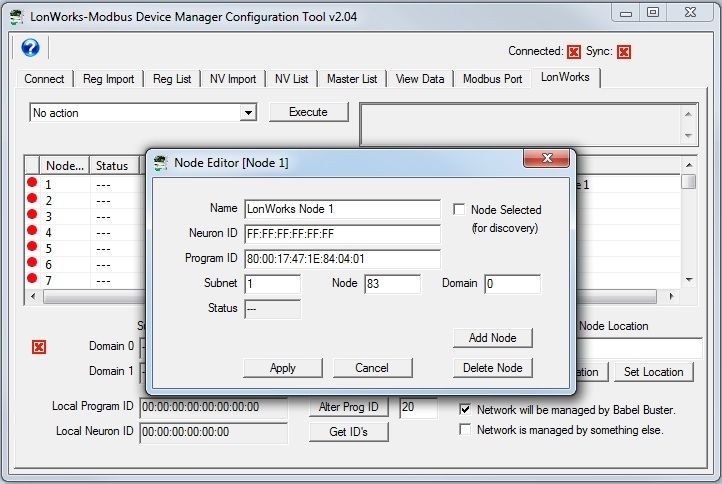 A network management tool such as Echelon's LonMaker is normally used to "bind" NVs in the gateway with NVs in other devices. A Network Variable Input (NVI) means other devices will write data to this NV. The NVI is receiving "input" from the LonWorks network. A Network Variable Output (NVO) means data is being written to ther devices. The NVO is sending "output" to the LonWorks network. There are three different realizations of the same data within the LonWorks gateway. The direct connection to the LonWorks network is the Network Variable. The direct connection to the BACnet network is the BACnet object. . The direct connection to the Modbus network is the Modbus register. The translating connection in between is a gateway data object. At first, it may not seem clear why there needs to be these different realizations of the "same" data. The fact that the protocols are incompatible is why we need a gateway in the first place. But why not simply send the data "as is"? The following example is a frequently used translation. The Network Variable in the diagram below is LonMark type SNVT_temp. The LonMark specification for SNVTs (Standard Network Variable Types) provides the scaling for temperature transmitted over the LonWorks network as SNVT_temp. The raw data is a 16-bit binary number, but scaling provides 0.01 degree resolution. There is also a Kelvin offset in SNVT_temp. As a result, a temperature of 77°F is a raw value of 2992 in the LonWorks NV. That is probably not what your BACnet front end or Modbus PLC wants to see. Conversion from LonMark types to standard engineering units is done internally by the LonWorks gateway. When the NV is SNVT_temp, and the internal data object is defined as type 'floating point', the value contained in the internal data object is 25.2°C (when the raw data is 2992). LonWorks values are always metric. 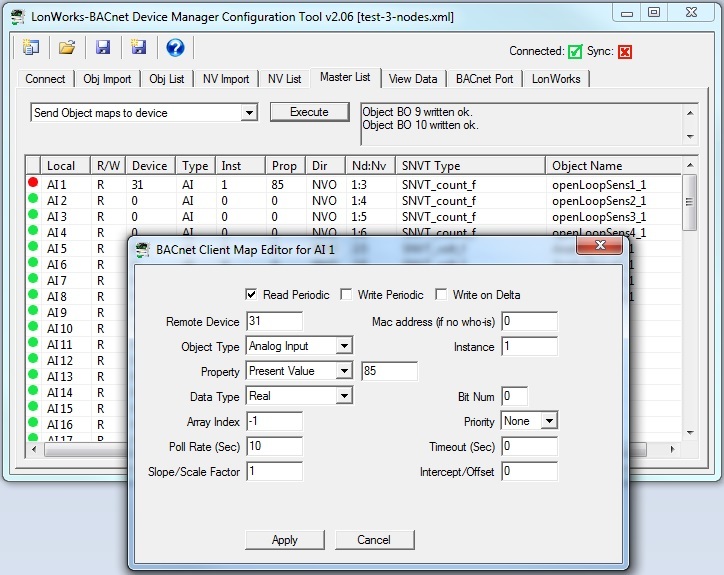 The BACnet object mapping or Modbus register mapping provides for further scaling. By applying a scale factor of 1.8 and offset of 32, the Celsius reading now becomes Fahrenheit when provided to BACnet as an Analog Input object or to Modbus as a holding register. Next we will discuss an even more compelling reason why data cannot simply be sent "as is". Many LonWorks Network Variables are a "structure", meaning a single network variable actually contains multiple pieces of data. 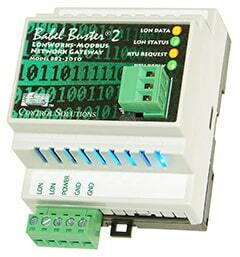 A BACnet object or Modbus register can contain only a single value. Therefore, it is not possible to do a direct one-to-one translation of these network variables to BACnet objects or Modbus registers. In the case of structured data, a single NV translates into multiple BACnet objects or Modbus registers, possibly not even of the same type. A commonly used structured variable is SNVT_hvac_status. It contains seven data fields. These need to be mapped to seven different BACnet objects or Modbus registers in order for BACnet or Modbus to do anything meaningful with the status information. This mapping is partly automated by the configuration software tool provided for the Babel Buster 2 LonWorks Gateways. We say "partly" automated because you do need to select whether or not to include the variable in your mapping, and you also need to enter any applicable scaling on the BACnet or Modbus side. Scaling for standard NV types will be handled automatically. Scaling for user defined NV types (UNVTs) needs to be entered manually. There are close to 200 different variable types, or SNVTs, specified by LonMark. You will need to go to the LonMark web site (www.lonmark.org) to obtain a copy of this documentation (download a copy of the LonMark Resource Files). It is unlikely that you will be able to effectively work with any LonWorks device without an understanding of the LonWorks Network Variables. The BACnet version of the LonWorks gateway contains local BACnet objects that you may configure. 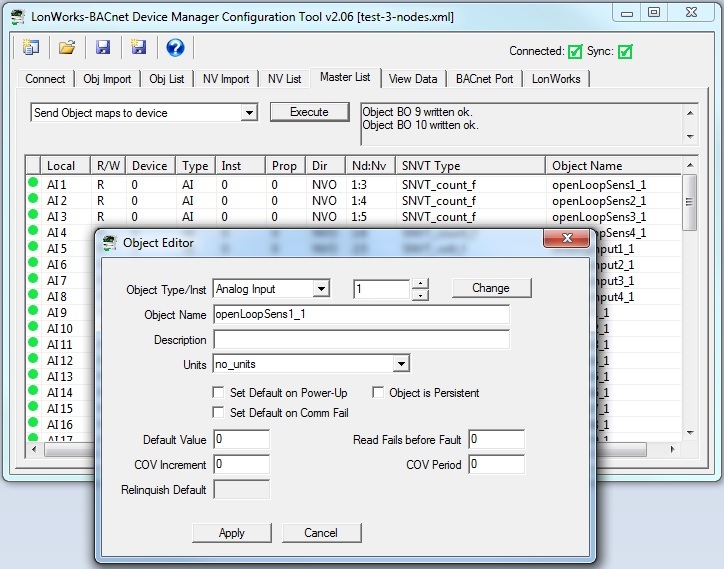 Other BACnet devices can read and write object properties in the gateway’s objects. These objects are mapped to Network Variables on the LonWorks side. 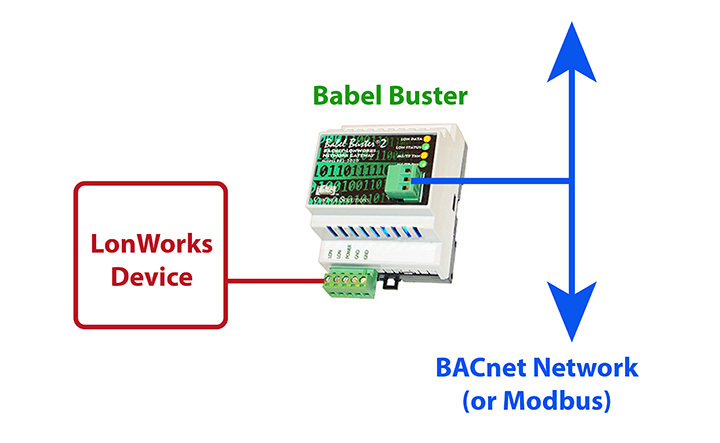 The BACnet version of the LonWorks gateway includes a BACnet client that can read and write objects in other devices. The gateway can be a client or server, your choice. 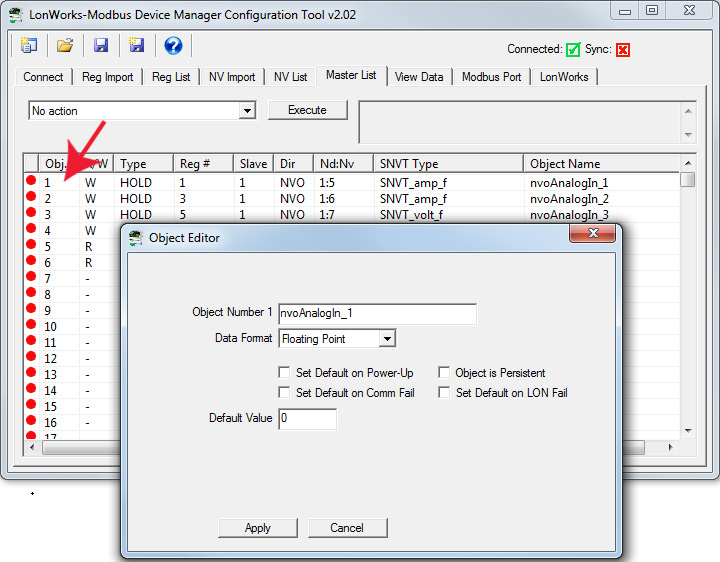 The Modbus version of the LonWorks gateway contains local Modbus registers that you may configure. Other Modbus masters can read and write these registers when the gateway is configured to be a slave (or is TCP). These registers are mapped to Network Variables on the LonWorks side. 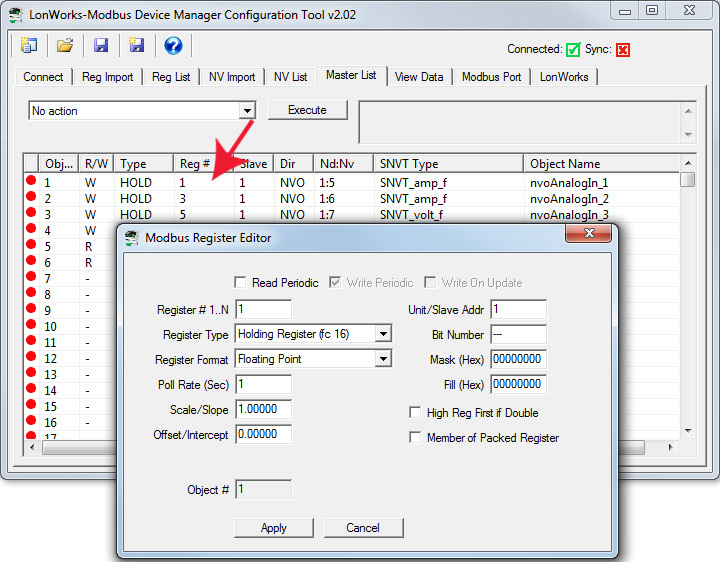 The Modbus version of the LonWorks gateway includes a Modbus master (or client) that can read and write registers in other Modbus devices. The gateway can be either master or slave when RTU, and can be client and server concurrently when TCP. Triggering the self-installation is easy. Enter the program ID of the type of device you want to search for, and enter all FF’s for Neuron ID (LonWorks version of a MAC address). Upon seeing the Neuron ID of all FF’s at startup, it will search the network for a device having that program ID. We have lots of useful information, including videos and complete user guides, linked to each product on the respective product page. The gateways used for putting LonWorks devices on BACnet or Modbus networks are listed on this page. If you are going the other direction - want to put BACnet or Modbus devices on a LonWorks network - those can be found on our LonWorks Gateway page here.